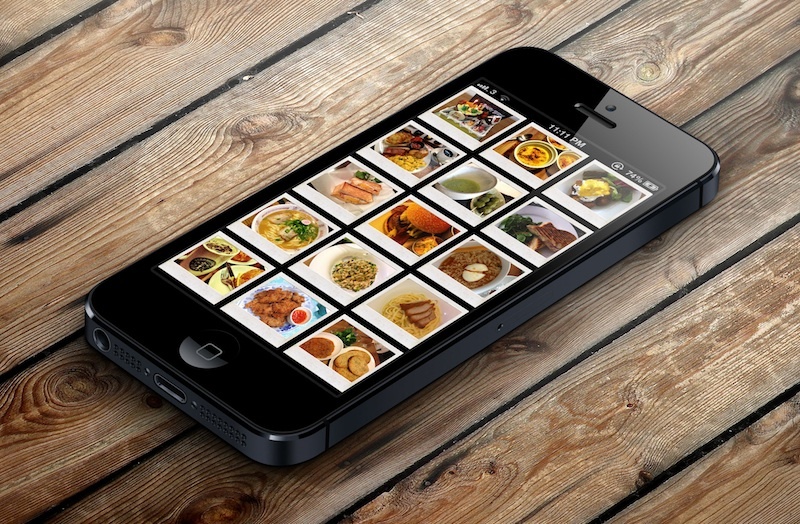 Do you still remember the Recipe app that we have worked on several months ago? At that time, we showed you how to display a list of recipes using UITableView. Wouldn’t be great if it can display the recipe in a nice grid view? The iOS 6 SDK introduces a new class called UICollectionView that allows developers to create grid-like layout out of the box. If you have no idea about grid-like layout, just take a look at the built-in Photos app. 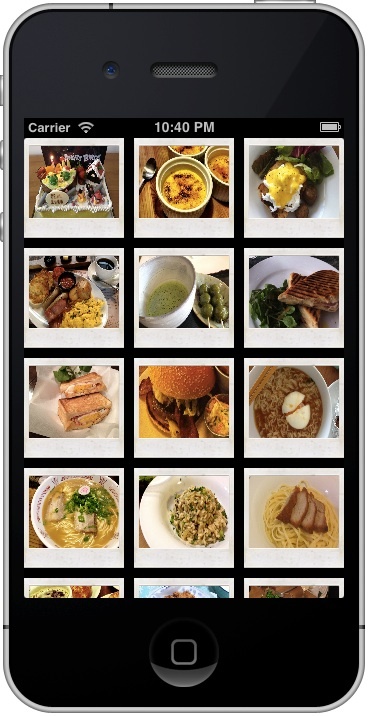 The app presents your photos in grid format. In the pre-iOS 6 world, you have to write lots of code or make use of other libraries in order to build a similar layout. The UICollectionView, in my opinion, is the most spectacular API in iOS 6. Not only it simplifies the way to arrange visual elements in grid layout, it even lets developers customize the layout (e.g. circular, cover flow style layout) without changing the data. The UICollectionView operates in a similar way to UITableView. While UITableView manages a collection of data items and displays them on screen in a single-column layout, the UICollectionView class offers developers flexibility to present items using customizable layouts. By default, the SDK comes with a UICollectionViewFlowLayout class that organizes items into a grid with optional header and footer views for each section. The UICollectionView class manages an ordered collection of data items and presents them using customizable layouts. Collection views provide the same general function as table views except that a collection view is able to support more than just single-column layouts. Collection views support customizable layouts that can be used to implement multi-column grids, tiled layouts, circular layouts, and many more. You can even change the layout of a collection view dynamically if you want. Cells – instances of UICollectionViewCell. 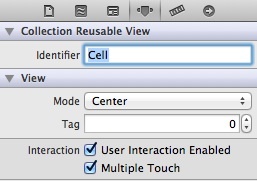 Like UITableViewCell, a cell represents a single item in the data collection. The cells are the main elements organized by the associated layout. If a UICollectionViewFlowLayout is used, the cells are arranged in a grid-like format. To better understand how UICollectionView work, let’s get some hand-on experience and build a simple app. 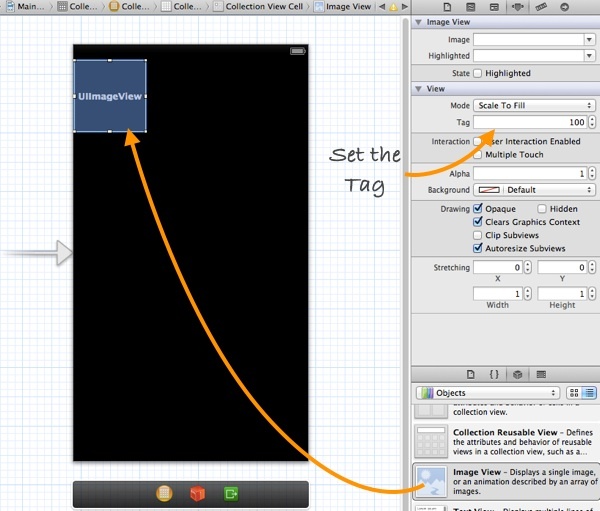 Open Xcode and create a new project using the “Single View application” template. 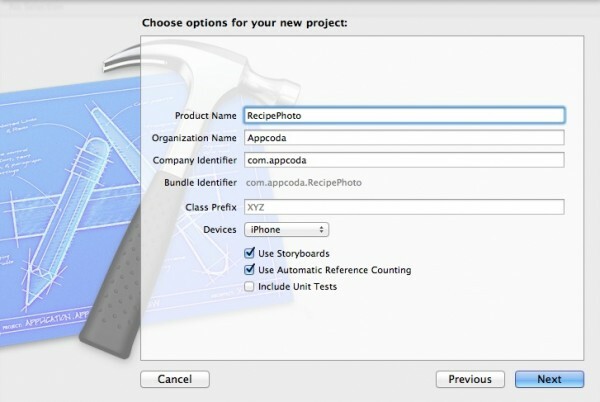 Name the project as “RecipePhoto” with “Use Storyboard” and “Use Automatic Reference Count” enabled. Note: Please make sure you use Xcode 4.5 or up to create the project. Go to Storyboard and delete the default view controller. Instead, add a Collection View Controller from object library. In the “Size Inspector” of the Collection View, you can change various size-related attributes. Let’s alter the size of the cell and change it to 100 by 100 pixels. Next, select the Collection View Cell and set the identifier as “Cell” in the Attribute Inspector. Then, add an Image View to the cell. Xcode automatically resizes the image view and make it fit into the cell. In the “Attribute Inspector”, set the tag value to 100 for later reference. In Project Navigator, right-click and select “New File”. 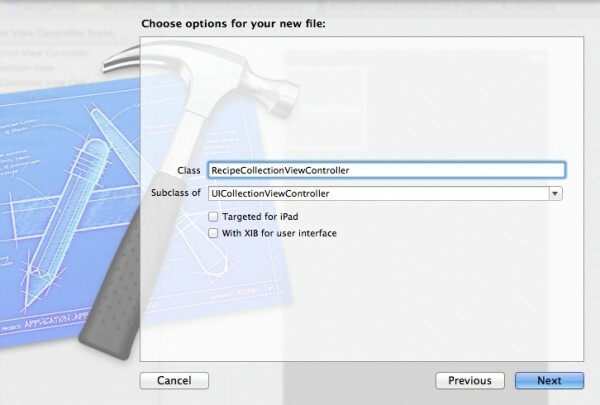 Create a new class that is a subclass of UICollectionViewController and name it as RecipeCollectionViewController. Go back to Storyboard and assign it as the custom class of the Collection View Controller. As said, the UICollectionView operates in a very similar way to UITableView. To populate data in UITableView, we have to implement two methods defined in the UITableViewDataSource protocol. Much like the UITableView, the UICollectionViewDataSource protocol defines data source methods for providing the data of the collection view. At least, you have to implement the collectionView:numberOfItemsInSection: and collectionView:cellForItemAtIndexPath: methods. Let’s move on to code the RecipeCollectionViewController class. First, download this image pack, unzip it and add all the images into the Xcode project. The collectionView:numberOfItemsInSection: method returns the number of recipe images. The cellForItemAtIndexPath: method provides the data for the collection view cells. We first define a cell identifier and then request the collectionView to dequeue a reusable cell using that reuse identifier. 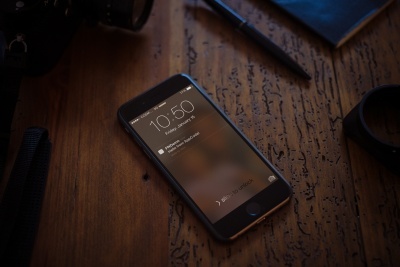 In iOS 6, you no longer need to create the cell manually. The dequeueReusableCellWithReuseIdentifier: method will automatically create a cell or return you with a cell from re-use queue. At last, we get the image view by using the tag value and assign it with a recipe image. Now compile and run the app. 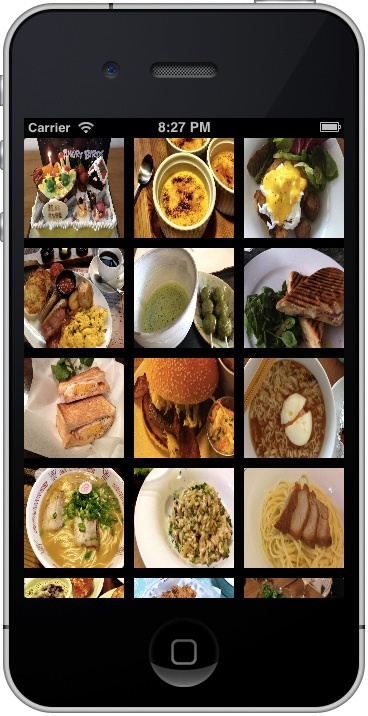 You should have a grid-based photo app. 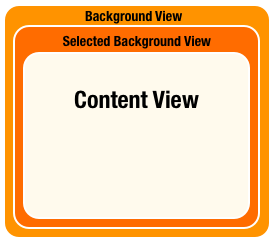 Selected Background View – the background view when the cell is selected. When user selects the cell, this selected background view will be layered above the background view. Content View – obviously, it’s the cell content. We have already used the content view to display the recipe photo. We’ll make use of the background view to show the picture frame. In the image pack you downloaded earlier, it includes a file named “pic_frame.png”, which is the picture frame. The size of the frame is 100 by 100 pixel. In order to frame the recipe photo, we’ll first resize the image view of cell and re-arrange its position. Go to Storyboard and select the image view. Set X to 5 and Y to 8. The width and height should be changed to 90 and 72 pixels respectively. Cool, right? That’s why I said the UICollectionView is a great addition in iOS 6 SDK. In this tutorial, we just explore the basics of the class and using the default grid-based layout (i.e. UICollectionViewFlowLayout). 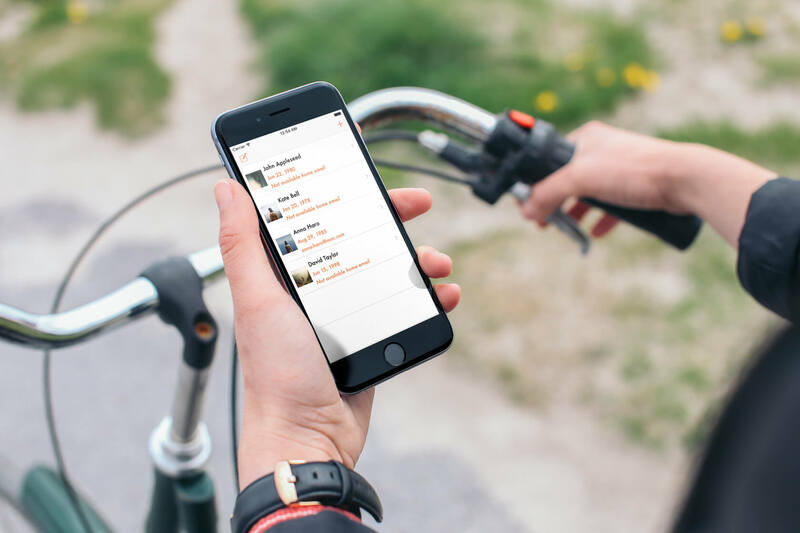 By developing custom layout, you can organize the collection of data in coverflow style or even more stylish format. In later tutorials, we’ll further talk about the decoration view, supplementary view and show you how to create your own layout. If you’ve followed our Recipe App tutorial, try to modify the app and convert it to use UICollectionView. For your complete reference, you can download the full source code here. As always, leave us comment and share your thought about the tutorial. Nice tutorial ! But it’s if run on iOS < 6.0 ? How can we make the photo to display in a new window and also pass them with the finger to the next one. Also with double click to make zoom. Good point! But I belive it’s enough to just make the white background color a bit gray (or any other color than white), right? 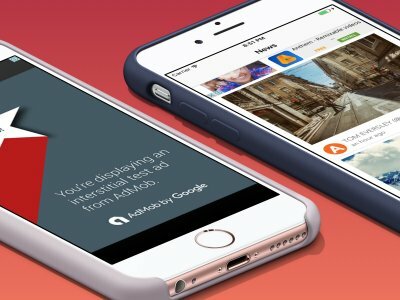 another fantastic tutorial, this is my favorite ios resource, great, easy to understand tutorials! I would like to be a me to click on the collection cell and have a full size view of the image. How would I go about it? Love your tutorials!! – first you need to make sure to embed your collection view in a ‘navigation controller’ by clicking it and then in the menu choose Editor > embed in > navigation controller. This enables you to use segues. – then add a new View Controller on your storyboard. CTRL-drag from the collectionview cell to that new view controller and select ‘push’ as segue. Click the segue thingie and give it the identifier ‘displayDetail’. – in your file navigator, rightclick and do ‘new file…’, Chose Objective C class, name it RecipeDetailView Controller and make it a subclass of UIViewController. Go Back to the storyboard, and of that latest view, change the class from the default ‘UIViewController’ to your ‘RecipeDetailViewController’ (creating this sub class because we will want to add an image property to it!). – In storyboard, drag an image view on your detail view. Switch to ‘assistant editor’ mode in the top right, and control-drag that imageview to RecipeDetailViewController.h, so it will create the new IBOutlet UIImageview property thingie. Give it a name like ‘imageview’, and make sure there is an @synthesize imageview; in the RecipeDetailViewController.m. Tataaah, that should do it! If you run your app now and tap one of his images, it should now go to a ‘detail view’ showing a large version of the image. Hi! Thanks for your mini-tutorial. Wouter, Thanks for that extra tutorial. I found it very helpful as Simon’s kept crashing for no apparent reason where as your’s seems to do the trick without being overcomplicated. Q: Do you know if it’s possible to use UIColletionrow to make items scroll horizontially / section? Would make a very nice UI for apps w different categories and subitems. When I use tabBarController as project, It will crash. Yes, we’ll talk about it later. Stay tuned. FYI for those here looking for the same: I wrote in another comment a bit below a fairly detailed explanation of how to do just this, using only the stuff that we already learned here! Hey, how to create (tab bar+collection)–>navigation–>tableView–> viewController by storyboard or code only? Both will work. But for beginner, it’s easier to use Storyboard to embed a view controller into a navigation controller / tab bar controller. First, select the view controller you want to embed in Storyboard. From the Xcode menu, select Editor -> Embed in -> Navigation Controller / Tab Bar Controller. You don’t put anything in the .h file. The important step is to tell the storyboard which class it is. Simon tells you how to do this in the Coding the CollectionView section of the tutorial. If you can’t get it look up how to assign a custom class to the storyboard. How can i make the cell stay always in the center of the collection view? I don’t get the grid layout and the app crashes in the simulator. im using Xcode 4.6.1, What am i doing wrong? We would need more info to find your problem. I would try downloading the source code and then compare your project to the working one side by side. You can then see what you did wrong. Hi,nice tutorial.i need a help.i am creating a sound based app.when person click on grid element a corresponding sound to be played.can you tell me how to get it done? Anybody have any idea on this error? in the method declaration do you have like that? because the collectionView variable was passad in the method argument, and you need a reference to use. maybe the method declaration are diferent in your code. when I use default DataSources and Delegates, I copy the method declaration in the apple reference. Hi, this is a great initiation tutorial for UICollectionView. I have a few questions though. First, why don’t you set the protocols and delegates at the @interface section of the .m file? Also, when I implemented the same example on my app whenever I try to scroll the app crashes with no more output that “(lldb)” and a EXEC_BAD_ACCESS on Thread 1. Any idea of what could be happening? I’ve checked many times item by item on your code and my implementation and it’s exactly the same. Thanks again for such a great example! Why is it that in UITableView we had to add the protocols UITableViewDelegate and UITableViewDataSource, but here we don’t? The tutorial with the UITableView used a ViewController but here it starts off as a CollectionViewController instead of a ViewController with a CollectionView on it. number of rows per section? Probably I missed something but can not see what is wrong. I have the same issue. Did you manage to fix this on your end? The tutorial sets 100 for both the CollectionViewCell and the UIImageView. I unset the one on the CollectionViewCell, but now nothing shows up. I used something else for CollectionViewCell. Can’t remember at the moment, but probably something like 101. Hello, I have a problem with code when I add this line: recipeImageView.image = [UIImage imageNamed:[recipeImages objectAtIndex:indexPath.row]];the bug is “property image is not found on object of type Array, are we declaring it? so just rename recipePhotos to be recipeImages and it hopefully should work. Nice Tutorial !!!!! But in here I am Unable to set the Frame Setting of the Cell that you Set here X=0,Y=20& length and width I can’t set the value Please help me in this!!!!!! I am struggling how to use CollectionViewFlowLayout… I need to add Labels dynamically using collection view… I have posted an image below… I want exactly the same layout… Please help me out… I would be very grateful to you…. Thanks in advance…. I hope You had follow the Tutorial for UICollectioView Layout UI so to integrate the Grid View With Label and Some other UI elements you have to use UIView in the collection View Cells , Adding those give UI-elements with UICollectionView is Simple .here I given the ScreenShot that to delete the Default viewController in the Storyboard and get the UICollectionView Controller That it!!!! When I run this app, it complies without errors but shows blank screen on the simulator. Can anyone suggest what would be the problem. it probably means that you have not set the UICollectionViewController to use the custom RecipeCollectionViewController class you wrote. 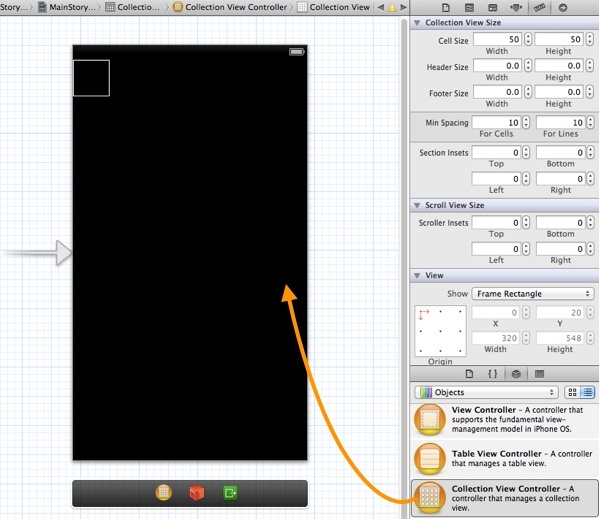 in the storyboard, click on the UICollectionViewController, then on the right hand side panel click Identity Inspector. then in the Custom Class field select the RecipeCollectionViewController option. there is no option to add RecipeCollectionViewController as custom class.. even i added class with name of RecipeCollectionViewController .. can u tell me whats wrong with it??? I am struggling how to use CollectionViewFlowLayout… I need to add Labels dynamically using collection view… I have posted an image below…I am adding labels dynamically by using a text field and depending on the width of the string the cell size should be increasing….I am unable to make size of cell…. I want exactly the same layout as shown in below image … Please help me out… I would be very grateful to you…. Thanks in advance…. Thank You.. I always get proper solution from this site. Thanks. great. thanks for the tutorial! Just tried the dropbox link again. It works. Would you please try again? Hello, this is a great tutorual! I am creating my own app which has a collectionview, within it I have collection cells containing images. When I run the simulator everything runs smoothly and my collectionview has a nice image gallery. When I try to archive the project and ad-hoc test it on my phone everything works perfectly but the collectionview. All my collection cell images seem to disappear and are replaced with grey blocks. Any suggestions or ideas?? 11:11 in the first image. Second in-picture 11:11 in this week.